Commonly we can easily find ourselves in the habit of finding the process of menstruating a complete inconvenience. We don’t live in a world in which menstruation and the associated discomfort are a valid reason to take a day off work. We live in a society in which our menstrual needs are not respected – for example, tampons have a GST applied to them! The fluidity of a woman’s body is not honoured in our society in a whole myriad of ways, and for women in many developing countries, the mere presence of menstruation can be dangerous. For Ashtanga Yoga practitioners, in the same way a break from practice is recommended in the first trimester of pregnancy and the first 3-6 months post natally, it is taught that women take 3 days of rest from Ashtanga Yoga practice when they are menstruating. In yogic terms this is because menstruation is the downward flow of energy – apana vayu and the practice of the bandhas – is contrary to this flow, thus rest from the vigorous sequence is encouraged. Abstaining from Ashtanga Yoga practice may also have roots in strict Brahmin practices wherein women are thought to be ‘dirty’ during their period. Perhaps originally the practice of cloistering a woman away form the household allowed women an opportunity to rest from her normal duties and be nurtured by her family. Pattabhi Jois as a Brahmin Hindu would not touch women during this time, and Sharath Jois has continued the tradition of recommending women stay at home during this time (there is no option to practice other limbs during asana time in the Mysore shala). The tradition of cloistering women during menstruation as it is expressed in patriarchy is more often a banishment than celebration of a woman’s cycle. Personally I have reimagined the role of taking rest during menstruation and have mostly honoured this time through embracing gentle restorative practice and meditation. In our Mysore room we don’t force women to take time off during menstruation but encourage to listen to their body and do what feels appropriate. Thus restorative practice in the Mysore room during menstruation or pregnancy for example. If we are fortunate enough to be in a situation where simply having our period does not bring us danger, either from unsanitary conditions or from taboos around menstruation, we can begin to celebrate this time of month as part of our experience of being a woman – although it is not necessarily a defining feature of ‘womanhood’. Personally I believe taking a rest for three days during menstruation is a wonderful way to give yourself some physical rest and give time to other meaningful pursuits in your life. The energy we dedicate to practice is huge! I reframe menstruation as not so much of an inconvenience, but an opportunity. A sacred pause in which I honour my cycle. Without it, I could not have had my two divine boys. 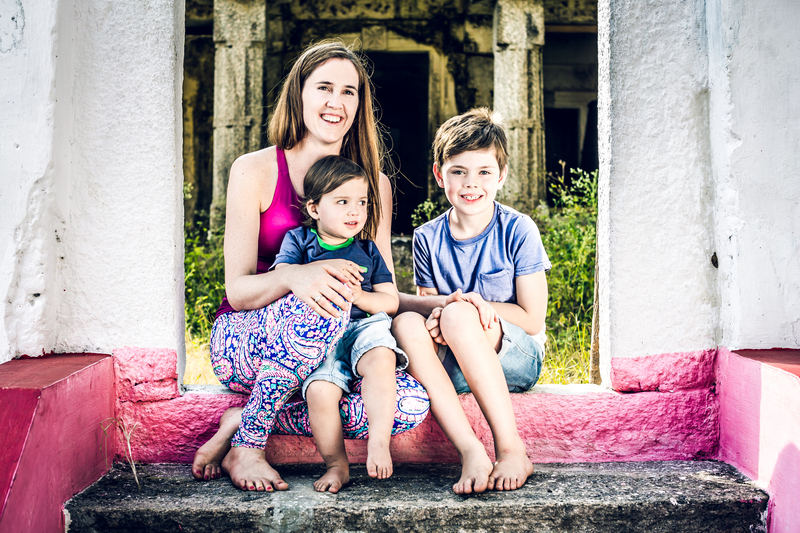 Sadly I see many women abusing their bodies with yoga practice and food restrictions whilst also ignoring their cycle – this can make it very difficult to start a family, as a healthy BMI helps us conceive. For me during my period is an opportunity to be at home with my children first thing in the morning without an agenda! I don’t have getting to practice on my mind, and I have more time with them. Often when I take rest for 3 days I try to cook some nutritious pancakes (yes they exist check out this book), and focus on being present with my kids. For those without children these mornings could be time to take your fur baby on a long walk. It may be a time to catch up for breakfast with an old friend who you don’t see as much as you like. It might be a morning for a sleep in and cuddle with your partner. Menstruation is a normal part of our life. We are not men, our body is different with different potentialities. Due to the athletic nature of Ashtanga Yoga, we often hear women talking about wanting to being stronger – I know the practice makes us stronger, but that strength isn’t about whether we can press into a handstand or attain a physical feat. It is the strength to be with what is, with love, with discrimination (viveka) day in and day out. For women and men the strength of mind is not necessarily reflected in what the body does or doesn’t do. We are unaware of the scars and pain people carry throughout much of their life, for some people half primary every day requires in internal strength that we can not measure form the outside. When it comes to menstruation, it is also an opportunity to reflect on the quality of mind that occurs on days we do not undertake an Ashtanga Yoga practice. It may be we practice meditation or pranayama, or a restorative yoga sequence. However taking the time off is an integral part of noticing some of the effects the practice has on us day by day. For women who are not menstruating somewhat regularly – without any apparent reason (eg breastfeeding) I would suggest you consider taking these days of rest. This is of particular importance if you have a low BMI (Body Mass Index) and have future plans to start a family. If you are not menstruating it is possible your fertility is diminished at this time in your life. Moreover, its normal to menstruate, unless you are going through menopause. Post children, there perhaps is less to be concerned about as we don’t need to think about our reproductive situation. For me following the birth of my second son, I spent a few months practicing during my period. It was an experiment for me – and at the time it was the greater good as it gave me the reason I needed to take some time to myself (mummy guilt much?). These days I usually take a rest, for me this is a way of honouring the rhythms in my body and opening up time and space for other aspects of my life. Also, I notice if I follow ‘Ladies Holiday’ as it is called, when I do practice for the remainder of the month I feel more energised and eager to get on my mat for practice each day. Yet as my childbearing years are now behind me, if I do feel like a vigorous practice then I go ahead and listen to my body. If you choose to practice – be assured that science is behind you – it is outdated to think that blood enters the fallopian tubes from inversions for example. And I get it – sometimes life gets tricky, and practicing becomes a life line. Everybody and everywoman has different needs and desires from her yoga practice. Indeed as a woman it is your choice whether to practice or not and always up to you to choose. However time out can also be wonderfully nourishing for the body and mind. So to return to our starting question? At the end of the day, it is your body, you get to choose. Fortunately when it comes to menstruation & practice we do have a choice.